Amina is terrified of public speaking, so when her Dad announces that he's signed her and her older brother Mustafa up for a Quranic recitation contest at their community's Islamic Center, she's terrified. But she has other issues as well: her best friend Soojin has started being friendly with another girl and Amina wonders if she's losing her friend. Worse, Soojin wants to change her name to something more Western-sounding (much to Amina's horror). Amina's uncle is visiting them from Pakistan and his presence disrupts her family as her parents attempt to impress him and as his conservative views conflict with Amina's own beliefs. But it is when their mosque is damaged by vandals that Amina learns to put all of these things in perspective and to find her voice. Given the subject matter, this is a surprisingly gentle middle reader. 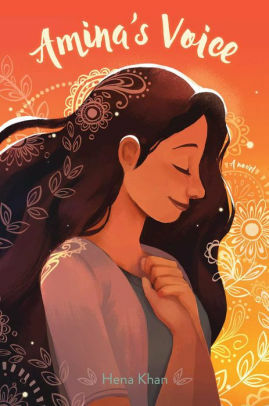 Placed in a Pakistani community outside of Milwaukee, it mixes everyday tween concerns about friendship and family, with observations about ethnic identity, xenophobia, and faith. The ending is a bit too rosy for my tastes and issues are resolved a bit too easily, but Amina is so appealing and the story so unique, that it is worthy of note.